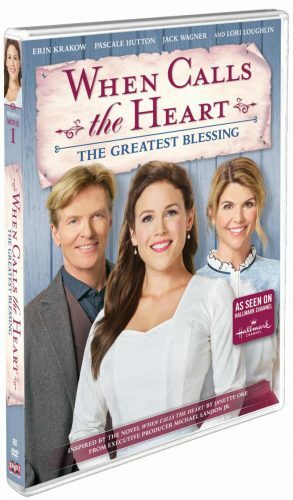 The television special from the brand-new sixth season, When Calls the Heart: The Greatest Blessing, debuts on DVD from Shout! Factory on March 5, 2019. From celebrated author Janette Oke (The Love Comes Softly series) comes a rigorous and romantic adventure as epic as the wide frontier. Erin Krakow (Army Wives), Jack Wagner (Melrose Place) and Lori Loughlin (Full House, 90210) star in When Calls The Heart, a beautiful story filled with “many of the values we all hold precious such as love, family, friendship, community, faith and caring about one another” (Military Press)! When a group of orphans become stranded in Hope Valley for Christmas, their caretakers — sisters who have a mysterious backstory — lead Bill (Wagner) to investigate the circumstances of their arrival. He discovers the sisters and their orphanage are in jeopardy, so Abigail (Loughlin) and the other residents rally to make it a Christmas to remember for the orphans. Elizabeth (Krakow), who is preparing for the birth of her child, organizes her students to engage in selfless gift-giving. That, along with a Christmas miracle, help bring wonder, hope, joy, and love to all this Christmas season.